The formula helps clear impurities that can block pores and lead to spots, without irritating skin. It hydrates the skin to leave it feeling soft and comfortable all day. Its formula with salicylic acid and zinc, both renowned by dermatologists for their purifying and regulating properties, purifies imperfections and helps prevent them appearing. Its light, non-greasy texture is instantly absorbed, to hydrate the skin, refine pores and even skin texture. Aqua / Water, Cyclohexasiloxane, Glycerin, Alcohol Denat, Nylon-66, , Hydrogenated Polyisobutene, Ammonium Polyacryloyldimethyl Taurate, Salicylic Acid, Zinc PCA, Cucumis Sativus / Cucumber Fruit Extract, Aloe Barbadensis / Aloe Barbadensis Leaf Juice, Hamamelis Virginiana / Witch Hazel Extract, Acrylates / C10-30 Alkyl Acrylate Crosspolymer, Cetyl Alcohol, CI 42090 / Blue1, Dimethicone, Disodium EDTA, Ethylhexyl Methoxycinnamate, Glyceryl Stearate, Hexylene Glycol, PEG -100 Stearate, Propylene Glycol, Triethanolamine, Methylparaben, Phenoxyethanol, Propylparaben, Parfum / Fragrance, Benzyl Salicylate, Citral, Hexyl Cinnamal, Limonene, Linalool. I like using this cream however I find after use I have this weird film left on my face kind of tacky. It's blue in colour and has quite a strong refreshing scent to it. Skin was clear after 1 week of use, skin did still look dull but redness was slightly reduced also. I wear this when I suffer break outs when I refuse to wear make up as it makes it worse. The tube is easy to push the product out, with a very thin end meaning no wastage. I really like this range and swapped to the the 24 hour one simply because I'd forget to use the day/night ones. 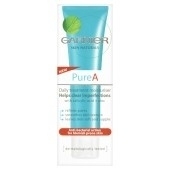 It works well and my skin is in much better condition for using it. This is a great moisturiser, light and fresh and it absorbs quickly into the skin. I've been using this for years and I don't believe it refines pores. The only downside is the tube it's in, it springs back into shape so you can't roll it to get every last drop out. Then again it's that cheap and widely avaliable from high street shops that it doesn't matter too much.